Khenchen Tsewang Gyatso Rinpoche was born in 1954 in a village near Lhakhang Dzong in the southern region of Tibet bordering Bhutan called Lhodrak. From his birth, his parents had a strong feeling that they should place him in the nearby monastery of Nub Namkha'i Nyingpo. The head lama, Namkha'i Nyingpo Rinpoche, was the tulku of one of the twenty-five disciples of Guru Padmasambhava. Along the deep Himalayan valley were many caves and holy places associated with Guru Padmasambhava and several of the great tertons who, in later generations, rediscovered his teachings. Among them were Guru Chowang, Terton Ratna Lingpa and Terton Padma Lingpa. The village was on the main trade route from Lhasa to Bhutan and the people were relatively prosperous. By the late 1950's the communist oppression had intensified and the social structure was turned upside down. In 1962 Khenpo and his family fled through the mountains and made their way through Bhutan to India. After arriving in India, he and his sisters were sent to a government boarding school for Tibetans in Darjeeling, West Bengal. There he began his formal education. The curriculum included the usual primary school subjects as well as English, Hindi and basic dharma teachings. At the age of ten he took the robes of a monk and received the vows of a novice (ge-tsul). He continued his education up to the eighth grade. Year after year, he was always at the head of his class. In 1969 he entered the Central Institute of Higher Tibetan studies at Sarnath, near Varanasi. There he followed a nine-year curriculum in Buddhist studies and general education under his principal teacher, Khenpo Palden Sherab, and other masters. His class work included Sanskrit, English and intensive studies in the textual traditions of Indian and Tibetan Buddhism. He graduated with the degree of Acharya in 1978, ranking first overall among the four schools of Tibetan Buddhism represented at Sarnath. His Holiness the Dalai Lama honored his achievement with the award of a silver medal. After graduation he was invited to teach at Palyul Namdroling Monastery at the Tibetan settlement in Bylakuppe, near Mysore in South India. For several years he was engaged in training the young monks and teaching in the monastic college, theNgagyur Nyingma Institute (Shedra). In 1983 he was enthroned as a khenpo by His Holiness Pema Norbu Rinpoche. 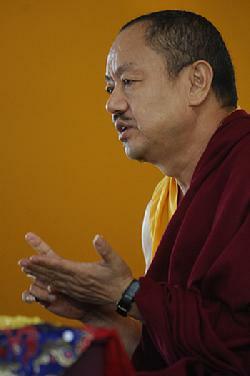 In the Nyingmapa tradition, a khenpo is a professor of Buddhist studies. Khenchen Tsewang Gyatso has received all of the major lineage empowerments and transmissions of the Nyingmapa school, including the Dudjom Tersar from Kyabje Dudjom Rinpoche; the Longchen Nyingthig Yabshi, and Nyingma Kama from Dilgo Khyentse Rinpoche; and the Rinchen Terdzod and Nam Chos from Pema Norbu Rinpoche. He has done intensive dzogchen practice under the guidance of Penor Rinpoche and other eminent masters including Khenpo Jigme Phuntsok Rinpoche and Nyoshul Khen Rinpoche. Pema Norbu Rinpoche has authorized him to represent the monastery and to teach, to confer empowerments and to give personal instruction in Buddhist practice. Khen Rinpoche has traveled and taught extensively in America, in Taiwan, and among the overseas Chinese communities in Singapore, Hong Kong, and the Philippines. His open, direct and thorough style of teaching has been very well received. He recently gave the empowerment of the Gyud Sangwai Nyingpo (Guhyagarbha Tantra) followed by extensive teachings on Mipham Rinpoche's commentary, Odsal Nyingpo. This was the first time that this fundamental Nyingma tantra was explained in such great detail in the USA.